Day One of the first day/night cricket test ever played. The match was played between Australian and New Zealand at Adelaide Oval in 2015. The December 2-6 match between Australia and England will be the first Ashes Test to be played in a day/night format. The first two days are already sold out and day three tickets are also almost gone. It is the second match in the five-test series and follows the Brisbane Test in late November. It will also be the first Ashes Test since the historic Adelaide Ovalredevelopment was completed in the South Australian capital in 2014. The biggest crowd for a sports fixture in a single day at the redeveloped oval is 54,468 for an Australian rules football match between Adelaide and Port Adelaide in 2015. The biggest test match cricket attendance at Adelaide Oval – 50,962 – was set on possibly the single most intense day of the infamous Bodyline Series in 1933 when Australian captain Bill Woodfull was struck in the heart by a short ball from Harold Larwood, forcing police to prepare for a riot that never eventuated. The test, which also featured Sir Donald Bradman, still also holds the Adelaide Oval attendance record of 172,361. South Australian Cricket Association Marketing, Communications & Membership GM Grant Warland said the prospect of breaking the single day records and the test match record at the inaugural day/night Ashes Test were “fairly good”. “If you look at the history of The Ashes you’ve got the Bodyline series, you’ve got the Centenary Test and then after that this would be the biggest game that’s ever been played as the first ever day/night Ashes Test match, it’s just unprecedented,” he said. Australia has played day/night tests against New Zealand and South Africa the past two summers, proving the success of the format by breaking the attendance record for a non-Ashes Test each time. Adelaide Oval’s unique ability to host up to 8000 members at a time in the Village Green and other hospitality areas behind the Western Grandstand also means there is a real chance the overall single day record of almost 55,000 will also be beaten. The members area at Adelaide Oval offers about 18,500 seats – about a third of the ground’s seated capacity. “This is our third one in a row and so far the fans have spoken with their feet – the attendance has just been outstanding,” Warland said. More than 50 per cent of General Admission tickets have been sold to interstate and international visitors. This has Adelaide hotels at capacity and also creates a windfall for the city’s thriving restaurant and small bar scene. 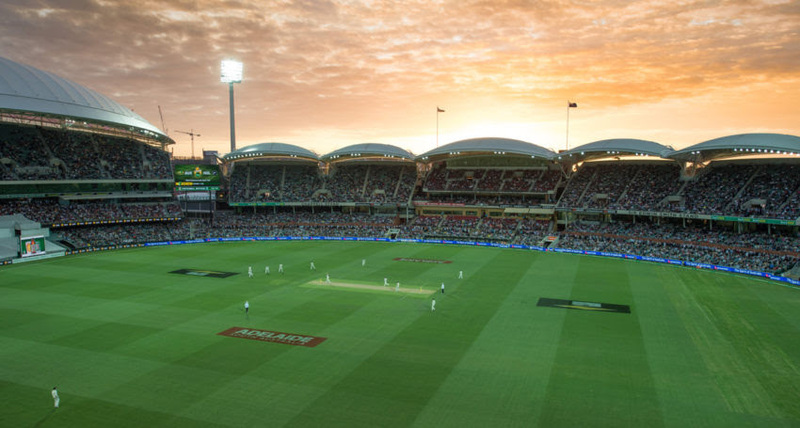 South Australia has ranked second for test attendances behind the 100,000-capacity Melbourne Cricket Ground in Victoria since the Adelaide Oval redevelopment was completed in 2014. This is despite Adelaide, with a population of 1.3 million, being the smallest mainland Australian city that regularly hosts test cricket. “Adelaide Oval has often been regarded as the most beautiful cricket ground in the world and with the renovations, the new stadium, the way it looks at night and the carnival atmosphere out the back in the members, it’s just unique in world cricket and people just want to come and be a part of it,” Warland said. “There’s the social element as well as the cricket element so it’s got everything – it’s Adelaide’s Melbourne Cup. Australian Hotels Association (SA) Chief Executive Ian Horne said the Test match week on the back of the traditionally strong months of October and November offered a fantastic opportunity for Adelaide’s pubs and hotels. “When hotels are near capacity that flows on and their requirement for laundry services and food and beverage services goes up and then it also flows on to the bars and restaurants and pubs in the vicinity,” he said.